Honduras appeared poised on the brink of renewed popular upheavals Monday as both leading candidates for president claimed victory in an election held a little more than four years after a US-backed coup ousted the country’s previous head of state, Manuel Zelaya. Government employees were sent home and heavily armed troops took up positions outside of state ministries Monday afternoon in anticipation of protests. 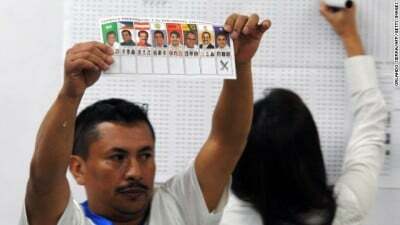 The country’s Supreme Electoral Tribunal’s official count pointed to the victory of Juan Orlando Hernandez, the candidate of the ruling right-wing National Party of incumbent president Porfirio Lobo. With ballots from approximately 60 percent of the country’s voting precincts counted, Hernandez led with 34.19 percent of the vote, compared with 28.83 for Xiomara Castro, the candidate of LIBRE (Freedom and Re-foundation Party) and wife of the ousted president, Zelaya. They were followed by 20.76 percent for the Liberal Party, which historically traded power with the National Party under the military-dominated two-party system maintained by the country’s ruling oligarchy for over a century, and 15.59 percent for the Anti-Corruption Party of popular sportscaster Salvador Nasrallah. There is no run-off vote under the Honduran system, meaning that a candidate with barely a third of the vote will assume office in a country that is sharply polarized politically. Also running for president was retired general Romeo Vásquez, the hardline military leader who carried out the June 2009 coup against Zelaya and directed the harsh repression that followed it. He received just 0.20 percent of the ballots cast. While both the electoral tribunal and the US ambassador, Lisa Kubiske, whose post historically has been akin to that of an imperial pro-consul, called on the candidates to await the final official results before declaring victory, neither Hernandez nor Castro complied. Hernandez, the president of the Honduran Congress, who recently pushed through legislation that creates a military police force to patrol the streets, proclaimed his victory Sunday night, declaring, “Today the people voted to leave behind the political crisis of 2009 that left thousands in Honduras jobless, migrating and divided, that left us alone and isolated.” The statement implicitly acknowledged the illegitimacy of the election convened by the coup regime that brought incumbent President Lobo to power. “manipulation of the figures” and stated that Libre’s exit polls showed a clear win for his wife. “We will defend the results, the triumph and the victory which we obtained at the ballot boxes and, if necessary in the streets; we will go to the street,” Zelaya declared at a press conference, surrounded by Libre leaders and supporters. Shortly after the press conference, several hundred Libre supporters marched down Juan Pablo II Boulevard in the capital, Tegucigalpa, carrying banners and signs, blocking traffic and chanting “No to fraud.” The protest was dispersed after a brief confrontation with riot police near the presidential palace. Even as Zelaya continued to proclaim his party’s victory, however, one of his former regional allies, the Sandinista leader and president of Nicaragua, Daniel Ortega, telephoned congratulations to the right-wing National candidate Hernandez and declared his desire to “strengthen ties” between the two countries. Ortega’s call followed those of the presidents of Colombia, Guatemala, and Panama. Incumbent Honduran President Lobo also took to national radio and television to congratulate Hernandez for his supposed victory. Sunday’s elections unfolded under conditions of profound crisis in Honduras, the second-poorest country in Latin America, marked by sharply declining living standards, rising violence, and government insolvency. Since the onset of the global financial crisis in 2008, the share of the Honduran population subsisting on less than the minimum wage of $350 a month has climbed from 28 percent to 43 percent. At least 1 million Hondurans are unemployed and another million are underemployed in a country of 8.5 million people. The country has the highest homicide rate in the world—with a national average of 85 murders per 100,000 inhabitants. The spiraling violence is attributed largely to the drug trade, with an estimated 90 percent of cocaine flights from South America funneling through Honduras. Drug money has largely corrupted the government and the police forces, which are responsible for a large share of the killing and crime. Honduras confronts some $5 billion in foreign debt—the equivalent of the entire 2012 government budget and roughly 40 percent of GDP—and is teetering on the edge of bankruptcy. Failure to pay teachers, health workers, and other sections of the public work force has led to continuous strikes. Both Hernandez and Castro indicated in the course of the election campaign that they would turn to the International Monetary Fund for a debt-refinancing agreement, which would undoubtedly be tied to painful economic restructuring conditions. The Libre party of Zelaya and Castro was initiated with a decision that was pushed through over the opposition of the majority of its membership to transform the National Front of Popular Resistance (FNRP)—a body that included unions, peasant organizations, and human rights groups formed to oppose the coup—into an electoral party. This project won support from a substantial section of the Honduran oligarchy, including elements that had strongly supported the coup which ousted Zelaya in 2009. Among them was Adolfo Facusse, president of the National Association of Industries, who explained in an interview with the Spanish daily El Pais his concern over rising poverty in Honduras.